Celtic Pagan Titanium Ring : LOVE2HAVE in the UK! This Celtic titanium wedding ring is another of our Celtic Trinity knot designs; this one based on the triple spiral graphic. 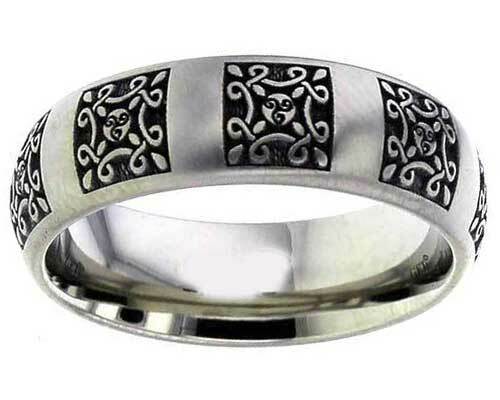 It is a domed profile ring, and like the other Celtic trinity knot titanium rings, it features a panelled design arrangement that is repeated around the rings outer. The triple spiral is also known as the Triskele and found inside the Newgrange Tomb in Ireland. This Pagan Triskele symbolised the three realms being land, sea, and sky but it is also more commonly interpreted by Christian belief as the holy trinity, a symbol of eternity. The engraving is created by a laser and leaves a slightly pitted quality to the engraved surface. The designer has advised us that the engraving for this ring takes an hour to complete. The carved surface itself is quite textured, therefore adding to the ancient Celtic symbolism depicted. The ring's width is 7mm, and it is available in a satin or polished finish.